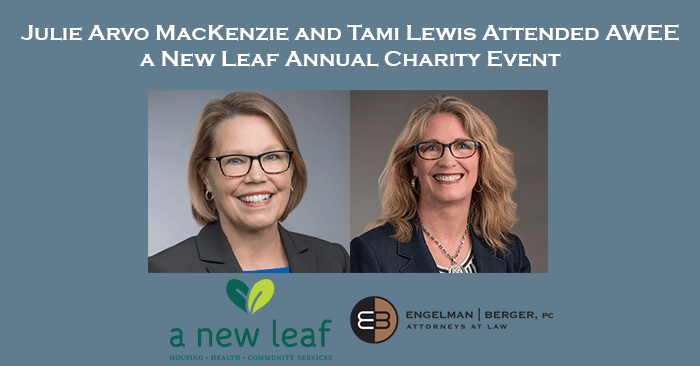 On March 5, 2019, EB attorneys Julie Arvo MacKenzie and Tami Lewis attended the AWEE A New Leaf “Cocktails and Clothes 2019” annual charity event. Each participant of the charity event was encouraged to bring gently-used professional business attire for both men and women in an effort to replenish the AWEE Clothing Boutique. These items included suits, dresses, tops, pants, shoes, belts, ties, purses, and more. After the event and throughout the year, AWEE gifts the clothes to those in need of interview and work attire. After the event, AWEE released a follow up and thank you video in which attorney Julie Arvo MacKenzie appeared. Follow this link to view the video, https://www.youtube.com/watch?v=miWBFKU06UQ. A New Leaf was founded in 1971 with a mission to promote “growth, hope, change, and new beginnings.” Throughout its existence, A New Leaf has remained committed to “Helping Families and Changing Lives” with the help of donors and volunteers that are able to gather and donate resources that greatly increase the impact of the organization on individuals in need. A New Leaf serves approximately 260,000 meals annually, provides 150,000 nights of shelter annually, hosts 12,000 counseling sessions annually, and reaches 32,424 individuals and families with critical resources. A New Leaf’s resources include homeless and domestic violence shelters, affordable housing solutions, youth services, foster care, counseling, financial literacy, neighborhood economic development, workforce support, and community services. As a result, clients of A New Leaf find successes in employment, healthier lifestyles, enhanced life skills, high school diplomas/GEDs, college degrees, and self-sufficiency.